Matt Sickels is a professional musician, guitarist specializing in education and performance. Based in Greensboro, North Carolina, Matt has studied music and the guitar in a variety of styles including jazz, rock, pop, funk, blues, alternative, Latin and classical. He was born in Akron, Ohio and began playing the guitar at the age of 12. Matt played guitar throughout high school in the jazz band, musical theater, and in the Ensemble performance group. Matt also performed along with his brother and father in a family group named The Sickels Boys Band who were well known and sought after in their community of Green, Ohio and played regularly throughout Northeastern Ohio in the Cleveland, Akron and Canton area. It wasn't long before he developed a strong repertoire and a love for all styles of music. Ever since then, he has had a passion for the guitar and a thirst for performing and creating music. Strongly influenced by the music of Carlos Santana, Miles Davis, and Joe Pass. Matt went on to further his studies in the highly renowned Jazz Studies Program at the Cuyahoga Community College in Cleveland, Ohio where he received his certification in Guitar Performance with an emphasis on Jazz Studies. There he studied under the tutelage of Lee Busch, guitarist, and Ernie Krivda, saxophonist, focusing on jazz theory, jazz improvisation, and jazz composition. After completing his studies in Cleveland, Matt moved to the suburbs of Atlanta, Georgia to attend the Atlanta Institute of Music's Guitar Studies program. Matt studied extensively with Carl Culpepper and Randy Hoexter, two musically-acclaimed instructors and mentors who he credits for bringing out the discipline and skills he would need for a lifetime of music achievements and expression. The Atlanta Institute of Music also provided Matt with opportunities to study with renowned guitarists Guthrie Govan and Cory Christiansen. Matt excelled in the Guitar Studies program and completed his certification ahead of schedule. Matt began his professional career as an Instructor at The Atlanta Institute of Music and began performing and recording with local artists. Today, Matt works and performs with a number of groups and small combo arrangements throughout the southeast and mid-west United States, and has been involved in several recording projects. He has written several compositions and continues to write music that is performed by professional musicians. 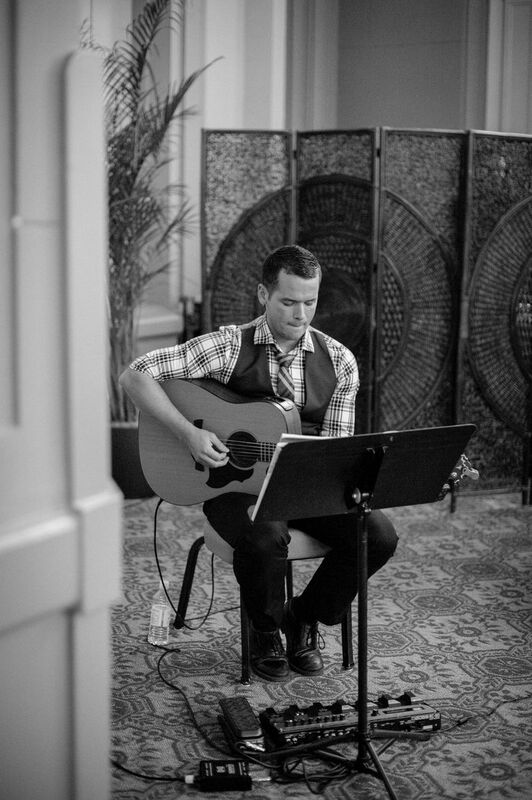 Matt performs for weddings, bar mitzvahs, private parties, wine tastings, jazz festivals, concerts and special events of all kinds. Matt continues to indulge his passion for the guitar and teaches guitar and music theory privately to roughly 30 students weekly. Strongly influenced by the music of Carlos Santana, Miles Davis, and Joe Pass. Matt went on to further his studies in the highly renowned Jazz Studies Program at the Cuyahoga Community College in Cleveland, Ohio where he received his certification in Guitar Performance with an emphasis on Jazz Studies. There he studied under the tutelage of Lee Busch, guitarist, and Ernie Krivda, saxophonist, focusing on jazz theory, jazz improvisation, and jazz composition. After completing his studies in Cleveland, Matt moved to the suburbs of Atlanta, Georgia to attend the Atlanta Institute of Music and Media's Guitar Studies program. Matt studied extensively with Carl Culpepper and Randy Hoexter, two musically-acclaimed instructors and mentors who he credits for bringing out the discipline and skills he would need for a lifetime of music achievements and expression. The Atlanta Institute of Music and Media also provided Matt with opportunities to study with renowned guitarists Guthrie Govan and Cory Christiansen. Matt excelled in the Guitar Studies program and completed his certification ahead of schedule. Matt began his professional career as an Instructor at The Atlanta Institute of Music and Media and began performing and recording with local artists.